The optimal blade design of the new AL-KO HT440 Basic Cut has been awarded the red-dot award for design innovation and the iF product design award in 2010. Ideal for maintenace cuts for smaller hedges, the 440mm blade has a 16mm tooth spacing, perfect for trimming fresh growth on hedges and shrubs. Award Winning - The AL-KO 440 Basic Cut has won several awards for its innovative and functional product design. Everything Straight - The integrated spirit level helps to achieve straight and horizontal hedge trimming. As a result, a ragged cut can be avoided. 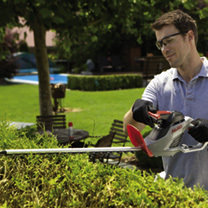 Best Quality - The high quality plastic housing is particularly sturdy and robust, thus guaranteeing the hedge trimmer achieves a long service life. Safety Guard - The blade end features a safety guard to protect the high speed blades from contacting walls or floors. Diamond Cut Blades - Always sharp and with a clean cut, this model benefits from Diamond Cut Blades.